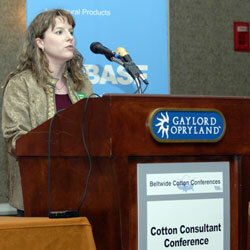 One of the experts on the program at the BASF Cotton Consultants Conference is Amber Shirley, BASF Technical Marketing Manager. Amber says that having Headline, a foliar fungicide, available for the first time means that cotton growers now have the full range of plant protection products available to them that other commodity growers have. She says that using a fungicide can create up to a 65 lbs. of lint/acre increase in cotton. She says that growers should talk to their consultants. Besides this session at Beltwide she says BASF will be holding a series of consultant conferences on a regional basis.